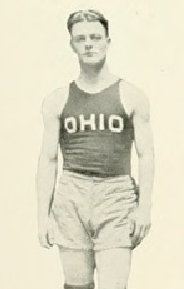 Howard “Red” Blair was high school athletic star in Mount Vernon, Ohio. He went on to star in football and basketball at Ohio State University. Blair was the head football coach of the University of Akron from 1927 to 1935 where he had a 43-30-5 record . He was also Akron’s head basketball from 1927 until the spring of 1936 posting an outstanding 89-40 record. From 1938 until 1946, he was the head football coach at at Southwest Missouri College where his record was 39-20-7. Howard Holt Blair Born: Feb 23, 1900 Died: Nov 30, 1947 Hometown: Akron, Oh.